Friends: tonight is for us. 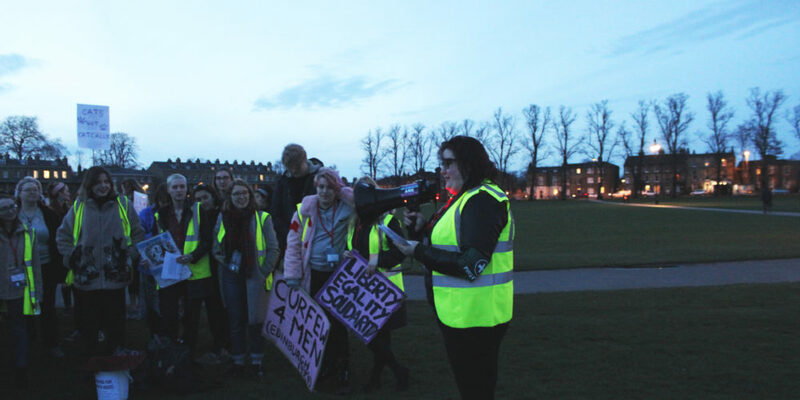 Though we have seen so much progress from where Reclaim the Night began, there is still so much more for us to do. One in five women has been sexually assaulted, and conviction rates do not do us justice. There are too many abusers walking freely on our streets. We all know someone who has been affected because it happens in our universities, in our schools, in our pubs, our sports teams, our workplaces, our homes and our streets. This is not good enough. It has never been good enough, and until we’ve stopped it, it’s never going to be good enough. Women deserve better than this; we deserve better than this. Tonight we march for our mothers, for our sisters, for our cousins and aunts and friends and for women who we may not know and who can’t be here. Tonight we march for ourselves. We march for and with survivors of domestic abuse and for all the people who are denied access to justice and the support they need due to these crimes, because the government is more concerned with making Brexit happen than supporting us. Tonight we march because misogyny is literally everywhere around us; out women in academic are denied professorships because of it; our students face the real risk of sexual misconduct from staff; our friends get hurt by people who should treat them better, and we get hurt because we are not mind readers and we can’t tell who actually has good intentions towards us on a first encounter. Men are scared their Tinder dates are going to be fat and women are scared their dates will literally kill them. We are told to walk in brightly lit areas, to carry our keys between our fingers, to dress more modestly, to not drink too much, to make sure we always travel in groups, and what are the perpetrators told? They are told that women who do not do these things are fair game. Everything we are told about keeping ourselves safe effectively comes down to ‘make sure he rapes someone else instead’. This is our reality and too many people do not understand the adversity we face in every aspect of our lives. Tonight we march to make them understand. We march for my friends and our sisters in Northern Ireland who cannot access safe, legal and free abortion; we march for everyone who has suffered because of backwards governments denying women autonomy over their bodies. 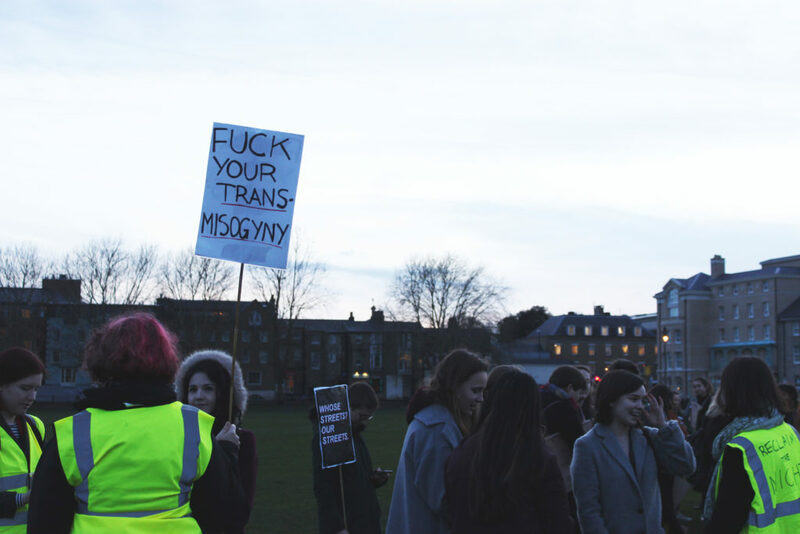 We march for our trans sisters, for whom walking the streets in the daytime can prove difficult, never mind marching with us this evening. We march for our non-binary friends who are so often forced into binary boxes that rule everything. We march for we’d workers who cannot report what happens to them for fear of repercussions. We march for Muslim women who are harassed simply for following their religion. We march for Black and Asian women who face more harassment and injustice than white people can understand. We march for our disabled women and we acknowledge that some of them have become disabled due to the violence inflicted upon them. Tonight we are loud and tonight we are channeling our anger and injustices into something positive. Tonight we are visible and we are collectively taking up space that is too often denied to us. Until we put an end to misogyny. Until our bodies are actually our own. And until every woman can walk the streets safely. Until then, we won’t stop fighting and that is why we’re Reclaiming the Night.